AROUND 11:40 a.m. every Sunday, they arrive at Foresight Studios, a rehearsal and performance space in the heart of Silver Lake, a hipster neighborhood in Los Angeles. They wear pink leg warmers, sparkly headbands and the type of tiny shorts not seen since Richard Simmons felt the burn in them in the 1980s. 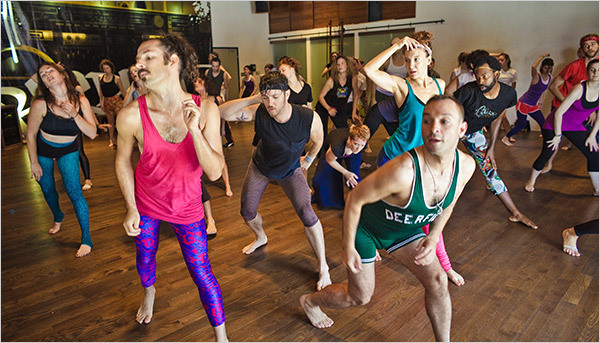 They are here for Sweaty Sundays, a dance class taught by Ryan Heffington, a choreographer, performance artist and designer with a soft spot for Lycra and bright pastels. Here, members of this creative class — artists, photographers, fashion designers and screenwriters — dance off the previous night’s excesses to a soundtrack of indie rock, techno, and 1980s new wave hits. And they do it while looking fabulous in Jane Fonda leg warmers and belted leotards. “It’s kind of an American Apparel ad come to life,” said Terence McFarland, 40, the executive director of the Los Angeles Stage Alliance, who is a regular. On a recent Sunday, Christopher Kreiling, a 33-year-old visual artist, was among the first to arrive. It was his first time, but he already had the look down: a pair of very short white corduroy shorts, a pink-and-white striped tank top and the all-important headband. Mr. Heffington, a lifelong dancer, moved to Los Angeles from Yuba City, Calif., when he was 18 and became involved in the fringe artistic community. These days he also works in the mainstream: Britney Spears and Gwen Stefani are among the celebrities who have been seen in designs from his fantastical clothing line. In the mid-1990s, he staged the Psycho Dance Sho — which is described online as a “psycho-sexual cabaret” — with another choreographer, Bubba Carr. Now Mr. Heffington, 36, serves as an artistic director for the experimental modern dance company Hysterica, and recently toured Europe with his arty pop band, We Are the World. Sweaty Sundays were born of a roving monthly club night, Fingered, that Mr. Heffington held in 2006 and 2007, where clubbers learned short routines as they nursed their beers. “People were so excited to see dance wasn’t this high art form that was unreachable,” Mr. Heffington said. Though he teaches professional dancers, his amateur friends asked him where they could learn a few smooth moves. “I had a hard time recommending a class that wouldn’t be intimidating or antiquated,” Mr. Heffington said. So he decided to start one. The first, in May 2008, had 20 students — “mostly friends, being amazing,” he said. Word spread, and he added a second class on Sunday and a weeknight class, Wet Wednesdays. The 50 slots fill quickly, and people are often turned away. There are plans for a DVD. Although he was in New York for two weeks in July to help choreograph a stage show of “The Addams Family,” he flew back to Los Angeles for a few hours to teach Sweaty Sundays. “It means too much to me, and it means too much to other people,” he said. On the Sunday that Mr. Kreiling tried the class, Lou Becker, 32, a dancer and Pilates instructor who wore a one-piece green wrestling outfit, was collecting the $10 fee from the customers, who included Dani Katz, 37, a journalist who has been a regular since January. A former dancer and yogi, she had injured her spine and credits Mr. Heffington with getting her back on her feet. “One time it took me two weeks to recover from his class, but I knew whatever pain I was feeling, on a deeper holistic level, it was doing more healing than hurting,” she said. THE class inspired a member to start a marching band, and one student, Kristen Leahy, wrote her master’s thesis for the Pratt Institute about it. Participants do learn classic jazz and ballet moves. Some of the nightclubbers have changed their habits. Ms. Carr is one of the 20 or so Sweaty Sundays dancers who go out on “Dance Attacks” or “Sweaty Attacks” — surprise performances in unlikely places, like the Grove at Farmers Market. “There’s this kind of performance art element to what he’s doing,” said Mr. McFarland, of the Stage Alliance. At noon, everyone filed in to the spacious studio. Mr. Heffington walked to the front, his long curly hair tied into a ponytail on top of his head. He wore shiny fuchsia-and-blue patterned leggings and a matching fuchsia tank top. The dancers moved in unison to Stevie Nicks’s “Stand Back” for the warm-up — amped-up versions of yoga poses, interspersed with aerobic jumps. Mr. Heffington punctuated each position change with shouts of “Up! Up! Up!” Within 30 minutes, the room was sultry with heat and perspiration. Then Mr. Heffington and his most experienced dancers leaped and galloped across the floor, and everyone applauded before taking a turn. The studio morphed into a runway, and a parade of one-piece jumpers, leg warmers and colorful tights flashed by. “It’s a way to not to take yourself so seriously,” Mr. Heffington said of the fanciful fashion. Maurice Harris, 38, a production manager for Juicy Couture, often comes to class wearing turbans and bright neon tights. That Sunday he wore a gold lamé headband and paisley Spandex. “I feel like I can be really expressive,” he said. For the final minutes, Mr. Heffington’s charges lined up to learn the first few combinations of a fast-moving routine set to Nena’s “99 Luftballons.” At the end, everyone cheered. Mr. Kreiling, the newcomer, concluded that he had two left feet. “I was pirouetting the wrong way and like, leaping at the wrong time,” he said. Yet he vowed to return the next week. “I’m going to make it my new Sunday church,” he said. Read at the NYT. Or download PDF.